David Williams was affectionately known as the "Goldfather". He was as much a mentor, teacher and father-like figure as he was the Director of Vanderbilt Athletics for 15 years. 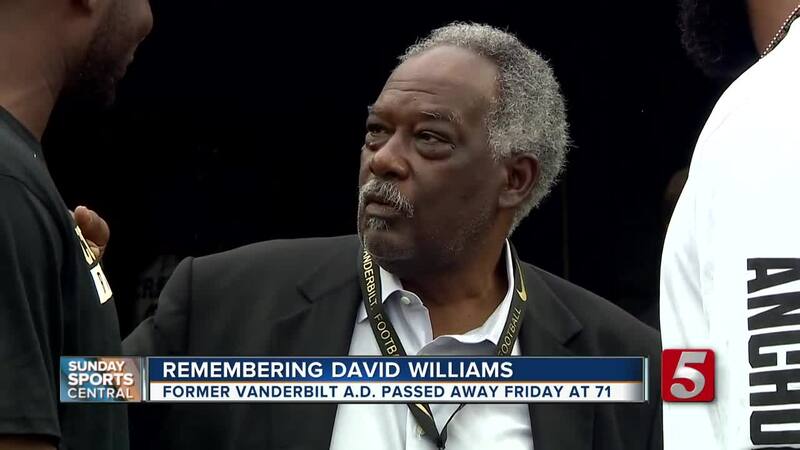 NASHVILLE, Tenn. (WTVF) — David Williams was affectionately known as the "Goldfather". He was as much a mentor, teacher and father-like figure as he was the Director of Vanderbilt Athletics for 15 years. That’s why his sudden passing on Friday has left Nashville and the sports world in shock and mourning the loss of a life well-lived. As the arms race for facilities in the NCAA took off in the early 2000’s and coaching salaries skyrocketed, Williams wanted to make sure Vanderbilt did things the right way. He never allowed his athletic department to lose sight of the university’s academic mission even while striving for championships in the SEC. Williams' focus on the individual didn't mean Vanderbilt programs took a back seat. Over his 15 years as athletic director the Commodores had unprecedented success. The football team ended a 26-year bowl drought in 2008, going to six bowls in all during his tenure. Vandy teams won 19 conference titles in all and captured four national championships. The first came in women’s bowling in 2007, a title the Commodores reclaimed last spring. The other two NCAA crowns came in baseball in 2014 and women’s tennis in 2015. It was a model that set Vanderbilt apart. It also helped attract his successor Malcolm Turner when Williams announced that he would be retiring. Williams' impact wasn't just limited to Vanderbilt. Student-athletes and coaches from around the country valued his wisdom and guidance. Alabama basketball coach Avery Johnson, a former NBA champion and coach, said Williams reached out to him after he was hired by the Crimson Tide. Williams was a pioneer in college athletics. He was the first black vice chancellor in Vanderbilt University history, and served as a role model for many young students. But he was most proud of being a father. He and his wife Gail had four biological children; Erika, David III, Samantha and Nicholas who made David a grandfather of six and a great grandfather. He has thousands more kids that wore the black and gold. David Williams -- gone too soon -- at just 71 years old.